Heavily redacted, mostly just because I like the Gaussian Blur filter. No, I don’t actually plan to write a Gmail/Google Voice productivity tip every day. However, today I just happen to have one. Parts of this actually came from a good friend, @jamesconnors (his site). He told me his system for inbox management: he has his inbox, a “follow up” folder, an I believe another folder for stuff he just wants to keep around. Anything in his inbox that he can’t quickly respond to in a minute or two when he sees it, he puts in his follow up folder. Every so often, maybe once every day or two, he goes through his follow up folder and takes care of everything he can. I liked that idea, and I also noticed at about the same time that Gmail Labs had a nice little widget called Multiple Inboxes. Basically, it allows you to make sub inboxes, of whatever size you want (mine are currently set to 10 messages) alongside your actual inbox on the Gmail dashboard (you can also put them above or below, too). Each inbox is really the result of a normal search string. For example, applying James’ ideas, I have one for the search “is:starred”. I basically star anything that doesn’t need attention, but I need to keep track of. A good example is package tracking info: I need to look at it for about a week, then I’m done with it, and I never need to actually respond. The second one I have set up is just “label:follow-up”. Any message I need to follow up on gets put in here automatically when I apply that label. Every so often, I go through and take action on them. The final goodie, which I just added today, is for Google Voice voicemail. I just got an invite the other day, but I was annoyed that it didn’t have better integration with my Gmail inbox. I suspect Google Wave will target this gap, but of course, it’s not out yet. 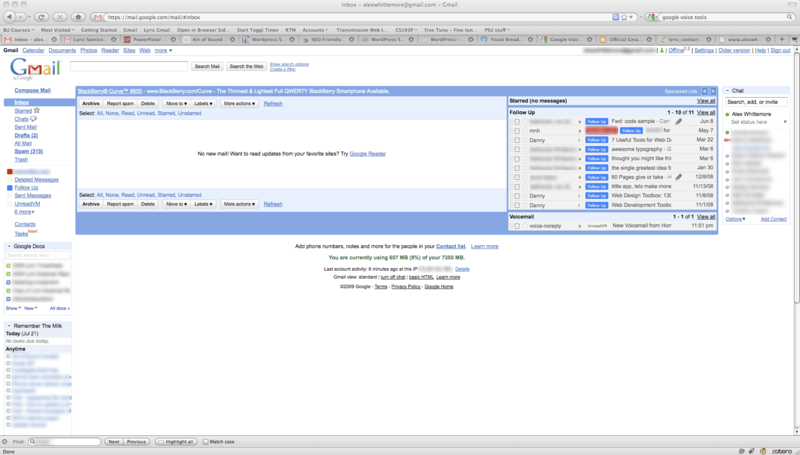 In the mean time, I have my Google Voice account set to email me when I get a voicemail (it also emails a transcript). That comes from an address called voice-noreply@google.com. My solution is twofold. I want new voicemails to come in here, not my regular inbox. But I don’t want them to leave as soon as I’ve read them, but I don’t want them to stay forever either. My solution is that I have a label called UnreadVM. I have a filter that matches “subject:voice-noreply@google.com” which ‘skips inbox’ and ‘applies label:UnreadVM’. My third Multiple Inboxes inbox matches the search “label:UnreadVM voice-noreply@google.com”. When I’ve read and am done with a voicemail notification, I just remove the label and it’s out of my inbox. I hope that if you try this, it brightens your email experience as much as it has mine!